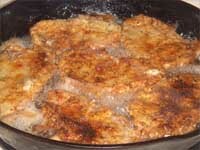 Fried Pork Chops Recipe by Cap'n Ron. These Fried Pork Chops were perfect. Crunchy on the outside, while moist and tender in the middle. Plus, they were full of flavor from the Steakhouse Blend. They even remained that way when I had them as leftovers the next day. I've tried frying pork chops in the past, and the coating always seems to get burnt during the time it takes to cook the inside of the chop. Turning the temperature of the oil down, makes the breading fall off, and the chops taste greasy. And using thinner chops really isn't my thing. By using this method, the Pork is already partially cooked, and just has to finish. Partially Pre-cooking is a restaurant trick that helps you get your order faster. If done right, a lot of foods can be partially cooked, so that you only have to finish them at service. 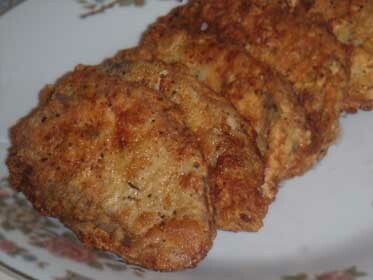 About the only way to get moist and tender Fried Pork is to pound it out as I do in my recipe for Chicken Fried Pork. Now, you'll have a real thin piece of meat that will be cooked through after it's been breaded and fried. I cooked a Large, Tied, Pork Roast, the other day, and ran out of time. I turned the temperature of the oven up to 350, and made sure that the top half was cooked to 145 degrees for service. 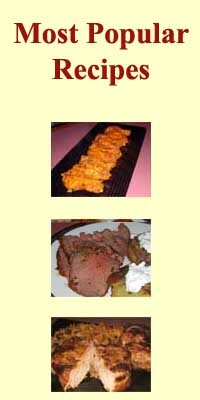 When it was time to eat, I separated the to halves, sliced the one on top, and saved the bottom one to finish cooking another day. I've had a hankerin' for Fried Pork Chops, even though I've had trouble with them in the past. And, it's another day! That's when I figured to try turning this partially cooked pork roast into chops, breading, then frying them. They were perfect. Crunchy on the outside, and moist and tender in the middle. Plus full of flavor from the Steakhouse Blend. They even remained that way when I had them as leftovers the next day. Out of mistakes, great things sometimes happen. We don't often have a partially cooked Pork Loin Roast hanging around, so it's best, and will be more consistent, if you cook the roast the day before, or up to 3 days ahead. 120 degrees, as read by an instant read meat thermometer seems to be the perfect temperature to turn into pork chops, and finish cooking them by frying. 1. Pre-heat the oven to 450 degrees. 2. Coat the Pork Roast as I show in my recipe for Roast Pork, but don't tie it together. Place the dry ingredients onto the fat side of the pork, then add enough oil to make it wet. 3. Place the roast on a rack in an oven proof pan, and place in the oven, on a middle rack. Cook for 10 minutes, then turn the heat down to 275 degrees. Cook the Pork Loin about 1 hour, then test with an instant read meat thermometer. You're only partially cooking this roast to 120 degrees. When it done, let it cool, then place in the refrigerator to get cold. 4. Prepare the Breading mix by combing the Flour, Steakhouse Blend, and salt in a bowl. Double it up for a second bowl. Whisk the eggs, then add the milk and mix again. 5. Slice the partially Roasted Pork into 1/2" slices. Dip in the four mixture, then the egg mixture, and finally into the second flour mixture. Set the Chops on a platter until you've coated all of them. 6. Pre-heat a heavy bottomed fry pan, like a black fry pan, with 14" of vegetable oil to about 350 degrees. 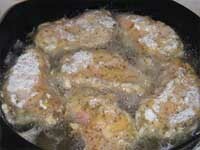 Place the breaded Pork Chops into the hot oil, being careful not to crowd them. When the first side begins to brown, flip them over and cook the other side. 7. When the second side is well browned, place them on a rack over a pan to drain while you cook the rest of the chops. I always drain Fried Food on a rack in a pan. I've found that anything that's been fried and drained over paper towels will become soggy. 8. I served these, 2 per person, with Onion Soup Mashed Potatoes, and Applesauce. The Steakhouse Seasoning Blend is one of my "Go TO" spice blends. I use it constantly as a replacement for Pepper in any recipe I'm cooking. Any leftovers should be wrapped, tightly, in plastic wrap and kept in the refrigerator. They can easily be re-heated in a little oil, and will be just as moist, and tender as they were the first day you ate them. This particular time, I had them with eggs, and Potato Pancakes made from leftover Onion Soup Mashed Potatoes.